Welcome to the Full Bloom Slot Reviews. Spring is here so get ready to watch all the flowers bloom, and all the beautiful trees change colors. 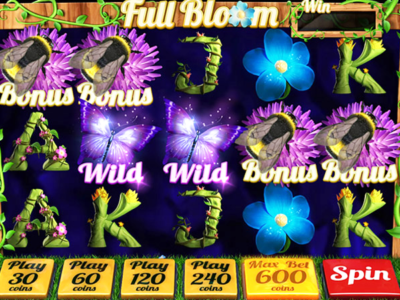 Slotland released “Full Bloom” slots in May 2017. This year has been an exciting for Slotland. They have been releasing new games every month! 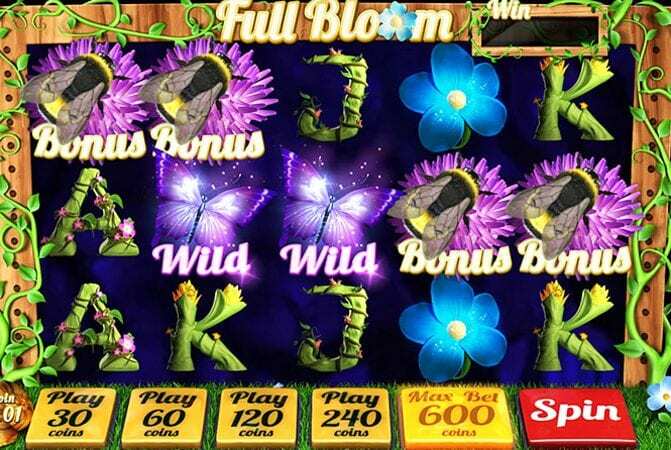 The Full Bloom progressive slot has five reels with 15 pay lines. Slotland casino gaming software powers this brand new electronic gambling machine with a progressive jackpot. Enjoy this game on the Internet in your web browser with no download instantly or using any mobile device. Slotland has some good games, and Full Bloom has joined them. Overall this is not the best game at Slotland, but it is fun to play and has easy wins. There is a Pick Me bonus round, scatter wins and wild symbols. The three-dimensional graphics are excellent and are no surprise based on the high-quality Slotland entertainment releases plus nice sized multipliers! Bet anywhere from 30,60,120, 240, and 600 coins playing this game that is ideal for high limit online slots players. Penny slot gamblers may enjoy this game, but 30 coins are the minimum that you can bet. The reason we say this is because thirty cents is the minimum dollar amount (30 coins) and six dollars is the maximum. The symbols that you will see in the wheels are indicative of the beginning of spring. You will see butterflies and bees and flowers blooming across the wheels in high definition. You will also see immaculate poker playing cards symbols all the way from the nine up to the Ace. The progressive jackpot randomly went spin the reels and betting the maximum amount. Score 3 matching symbols and you will get an instant win. Keep your eyes open for the butterflies and the bees. The butterflies are the wild, and they will replace all the other images to help you put together when a combination. They will not replace the bumble bee scatter. The bonus symbol is the key to getting into the pick me bonus round. During your free spins, you will have a chance to multiply your winnings by a very nice amount. The highest paying symbols are the yellow flowers.The yellow flowers are critical and come with large multipliers. Win 500 times your first bed when you land five yellow flowers in the wheels. Four of them have a 240X multiplier, and three have a 60X more multiple. You do not have to bet the maximum to score these multipliers.